Wow this is a cool picture! Is this your frog? Haha I love your quotes :) Cute lil sticky toe! WOW what a shot!! Very detailed--its amazing. Have a great w/w! What a cutie! Great capture, love the multiple reflections! And I tell Kermit, "It's not easy being a human being, either." Great shot. Isn't it cute!! 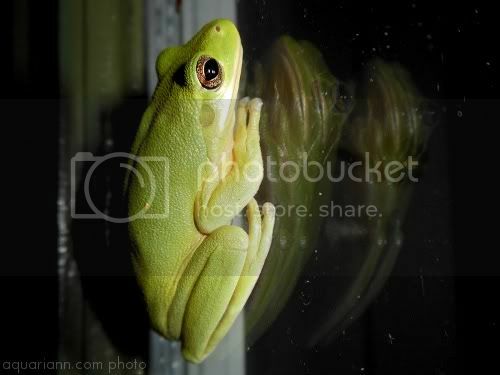 Love frogs, and the green tree frogs especially! When they were building the Sydney Olympic Park, they discovered a rare green and gold striped frog - that was cool! That is amazing! You are so lucky (I love those froggies!). great shot of the little green one! Tree frogs are all over my house. I found one on the side of my car one day and they love my sister's bedroom window. It's a wonderful shot. Very clear and focused. Look at that cute little frog! Great shot. Great close up! He's a beautiful color and I love the double reflection! Perfect quote to go with awesome image. I love your frog photo! I do my wordless thing on Friday. I hope it was okay to link to that. Great shot - what a pretty looking frog! Amazing capture and I love the quote to go with it! Thanks for hosting just linked up. What a cute frog! The picture is wonderful. I love his reflections in the glass, they're so beautiful. This is the 2nd frog I've come across on WW ! Awesome picture - love how you also captured the multiple reflections on the glass. OH my gosh that is so cute!!!! Beautiful picture, and lucky you! What an interesting blog... great shot of Kermit!! !